Keen on enriching the music industry with their particular touch of combining different musical genres and productions, Roul and Doors (RnD Musik) have become known over the past couple of years for their unique combination of melody, rhythm and energy. 2014 started off with a bang since their widely supported track Follow The Sound got to #9 on the Beatport Progressive House top 10. Their remix of one of the most beautiful female voices Christina Perri with her track Human on Atlantic Records followed quickly with support from the big jogs in the scene and their guest performance alongside #1 DJ Hardwell at Ushuaia, Ibiza on August 19th shows the progress and appreciation of their sound. Both guys started out as DJs for their study association and they have been hooked ever since. Even with a master’s degree in the respective fields of Biomedical Science and International Business, they couldn’t resist the temptation to pursue their dream of a successful career in the music industry. So instead of going for the logical choice, a career in their respective fields of study, they released their first production: ‘Revelation’ on DJ Roogs’ Hardsoul Pressings label in 2008, getting it tot #1 on Traxsource. A wise choice it has been, since their career took off a couple of years later when Defected first picked up their sound in 2011. Genre defining tracks got released such as ‘Gita’, ‘Forget’, ‘Trinidad’, ‘Assiduity’ and their remix for Copyright’s ‘Kama Yeah’ and Hardsoul’s – We Need More Love Remix. Several releases followed such as ‘Guinea/Cameroon’ EP (Copyright Recordings), ‘Saudi/Arabica’ EP (Defected Records), ‘Blackout’ (Flamingo Recordings) and ‘Elements’ (Revealed Recordings). The last two, collaborations with Franky Rizardo, have both been very successful. Blackout has passed half a million views on Youtube by now and Elements, released on DJ Hardwell’s label, achieved a #5 ranking in the Beatport House top 100 within a week. 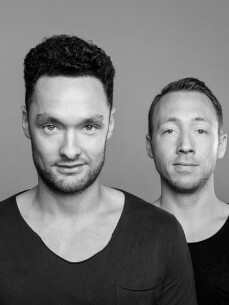 2013 followed with the consecutive releases of ‘Melody In Harmony’ and “Sir Ali (Turn It Up)” on Flamingo Recordings and already displayed the growing attention for these two Dutchmen with performances alongside Fedde Le Grand at one of the best and most notorious clubs in the world Ministry Of Sound in London, Fedde’s ADE show in Escape Club Amsterdam and last but not least, their debut at Sensation (Taiwan). Their productions don’t go unnoticed by other established DJs either, since there has been growing support by the likes of Fedde Le Grand, Tiesto, David Guetta, Nicky Romero, Dannic, Cedric Gervais, Danny Howard, Tommy Trash, Deniz Koyu, Dimitry Vegas & Like Mike, Sidney Samson and Sunnery James & Ryan Marciano to name a few.